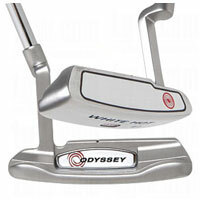 When I tested the 35″ version of this putter I noticed immediately that the offset design (plumbers neck hosel) beckons back to the Ping Answer days when that was one of the best putters. It’s a similar design with the offset heal-toe weighted features that have been so popular since Tom Watson. It has a tacky soft rubber contoured grip that feels good in the hands and will not lose its grip when sweaty or wet. The head is very hard and matte silver in color. The face has the Odyssey’s white super hard and very slightly textured polymer face. And the fact that the putter is not the latest and greatest out from Callaway means you get a reasonable price on a very good putter ($99).